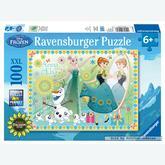 Frozen There are 9 products. 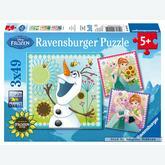 A 49 pieces jigsaw puzzle made by Ravensburger (reference 092642). Size: 18 x 18 cm (= 7.1 x 7.1 inch). 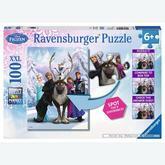 A 100 pieces jigsaw puzzle made by Ravensburger (reference 105571). Size: 49 x 36 cm (= 19.3 x 14.2 inch). Special series: Disney. In stock and ready to ship out. 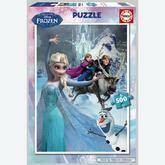 A 500 pieces jigsaw puzzle made by Educa (reference 16267). Size: 48 x 34 cm (= 18.9 x 13.4 inch). 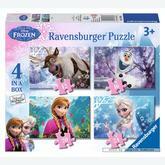 Special series: Frozen. 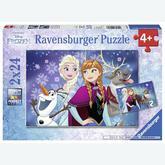 A 24 pieces jigsaw puzzle made by Ravensburger (reference 091157). Size: 26 x 18 cm (= 10.2 x 7.1 inch). Special series: Disney. 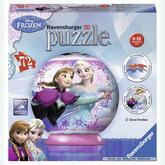 A 100 pieces jigsaw puzzle made by Ravensburger (reference 105847). Size: 49 x 36 cm (= 19.3 x 14.2 inch). Special series: Disney. 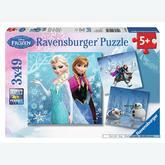 A 49 pieces jigsaw puzzle made by Ravensburger (reference 092451). Size: 18 x 18 cm (= 7.1 x 7.1 inch). Special series: Disney. 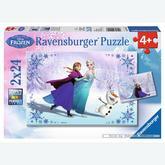 A 24 pieces jigsaw puzzle made by Ravensburger (reference 090747). Size: 26 x 18 cm (= 10.2 x 7.1 inch). Special series: Frozen.